A railway track. The short wooden bars are railroad ties, and the long metal bars are railway lines. 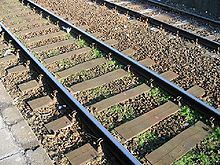 (rail transport, US) A heavy, preserved piece of hewn timber laid crossways to and supporting the rails of a railroad or a member of similar shape and function of another material such as concrete.